What happens with the hoop is that you pick it up the first time, it feels cool and kinda looks cool too! Then you learn a few things, and start to get curious about the way it works. Very curious. Then you become obsessed. You try to learn everything about hooping. You develop hoop crushes. You start going to hooping events and workshops. You meet really awesome people. You network online and stay in touch. Then the hoop becomes your community, your flow family. People have experiences you can understand. You can understand their experiences. Then, you begin to understand that the hoop is your spiritual practice, one of your deepest expressions of self. It becomes possible for you to imagine working with the hoop into your 70s and 80s. You are grateful to be given the opportunity to live in this body, to interact with this wonderful instrument during your brief visit on earth. Then Lara Eastburn expanded on this in a post for hooping.org, describing hooper's relationships with other hoopers. I wanted to use it as a vehicle to talk about my own evolution with the hoop. I definitely went through everything in that first paragraph, as I'm sure plenty of other hoopers have as well. I could probably even go back through this journal and find posts documenting each and every one of those key moments Ann mentions. What I want to spend some time discussing is the part that happens next, when you reach that "deepest expression of self" point. And really, I think this applies to all skill toys, or anything that requires practice to learn. When you first start out with a toy, in my case the hoop, you have limited knowledge of it. You have to get it acquainted to your body, and your body to it. This takes time. I've written in the past about learning to love and embrace this process, because it's so easy to wish you were already past it all, past the learning and the struggling. You want to be in that comfort zone where everything is easy and moves just come. Where you and the hoop are both part of one unified dancer. I know I did. Oh man. I remember watching hoop videos when I first started and going, "How do they DO that?" I remember drilling tricks into my muscle memory, waiting for the time I would try it and nail it. The truth is, you never fully get to that point where you can do everything you want to do. People are constantly coming up with new tricks, new combos, new styles that will inspire you and you will want to try. But you DO eventually get to a point where you are comfortable with the hoop, and you are able to do little to no thinking and just dance. And that's when you start to really connect with your toy. HOWEVER. It's so easy to miss the transition, because it happens so gradually. You'll be going along, practicing, dancing, doing everything in this effort to reach this state, and it isn't until you stop and take stock of it that you realize you are already there. You may have actually been there for a while. I had this realization today. Granted, this isn't the first time I've had it, it happens from time to time, but today I really THOUGHT about it. I thought about how connected I feel to the hoop when I dance with it, to the point that it's not so much a toy anymore but an instrument, an extension of my body. When I am dancing, I know where the hoop is at all times. I know where it will land if I exert force from a given angle. I know how to prepare my body to catch it before it even reaches its destination. I know how it will react if I grab it a certain way. These are the nuances that make someone a truly great hooper. I can honestly say that in the past several months, I've begun to feel that I am a great hooper. I've been complimented by, even told that I inspire, people who I watched in awe when I first started hooping. (Who am I kidding. I still watch these people in awe. The only difference is that now the feeling is mutual.) This is a powerful feeling, something that's very easy to let go to your head. Just because you are great doesn't mean you can't get better, you can't continue to grow. 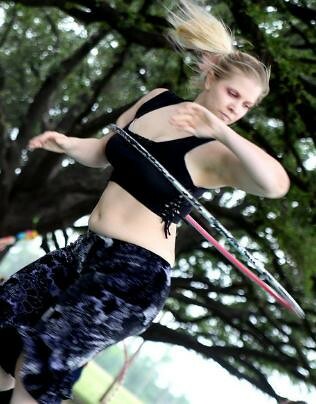 My hoop still surprises me, sometimes even eludes me, when I try a move I haven't drilled into the ground. I still watch hoopers and wonder how the heck they DO that. The hoop-to-body connection is something I try to stress in my classes, because I want my students to experience that feeling of oneness with the hoop as quickly as possible. Even though it isn't possible to get there all at once, realizing it's possible upfront makes it a much more palatable goal to attain. 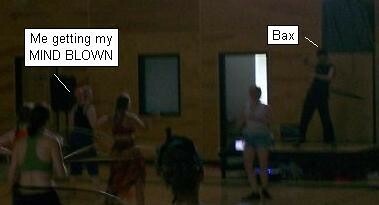 I don't know that I really understood the difference between compiling tricks vs. connection with your instrument until nine months into my hoop practice, when I went to Hoop Path Retreat 3 with Baxter and Ann (yes, the same Ann from the above quote). When Bax laid that concept out on the table, my whole perspective of hooping shifted, and I began to move in the direction of the hooper I am today, which is someone I'm extremely proud of. In some ways it feels like it happened all at once, the initial discovery, the obsession, the travel, the people, the spiritual growth. But then I realize it happened one step at a time, as I just kept stepping in the direction I wanted to go every day, towards feeling confident enough to really call myself a Hooper with a capital "H". This whole experience has taught me that I can build my own reality. When I first saw hooping, I didn't have a hoop of my own, I hadn't even touched a hula hoop since I was a kid, and I never would have dreamed of calling myself a dancer. All I knew was that for some reason, watching these people do this thing, I felt this deep stirring in my heart and I wanted to be a hooper. And now I AM a hooper. Because I let myself be. I could have stood in the way and said no, you're not talented/thin/athletic/graceful/motivated/worthy/etc. enough to be a hooper. There was PLENTY of this in my way, and not all of it came from myself. For some reason, with this particular hobby, I chose to push through all that and force myself into an area I was uncomfortable with: Letting myself be who I want to be. I could have easily stopped at phase one, picking up the hoop and thinking it feels & looks cool. But I kept stepping forward, over, under and through all of the opposition that stood in the way of getting to the next step of the hoop journey. I did it, and continue to do it, one day at a time. If you want it, it can happen. Just TRUST, and DO.